Rhodes had few gates because of the town location at the northern tip of the island and because the rest of the island was scarcely populated. Three gates responded to actual needs: St. Catherine's Gate gave access to Emporium, the commercial harbour of the town; St. John's Gate was the terminal point of the road which linked Rhodes with Lindos and the villages on the eastern coast; d'Amboise's Gate was the access towards the western coast. The list of gates is completed by three minor gates: St. Athanasius' Gate on the southern side of the walls was closed for centuries; Mills Gate provided a direct route to the mills located at the harbour; St. Paul's Gate gave access to Mandraki (It: Mandracchio), a small harbour, mainly used by the Knights' navy. St. Catherine's Gate (or Sea Gate) was the main gate of the town. It was built in 1478 by Grand Master Pierre d'Aubusson as part of an effort to strengthen the fortifications of Rhodes against a much feared Ottoman attack: the attack actually occurred just two years later. The gate however was unlikely to be the site of a possible assault by the Ottomans: the space between the walls and the harbour was too limited to allow the enemy to establish his camp there. This explains why the gate is more a work of art, a sort of grand entrance, than a defensive structure. The relief portrayed the Virgin Mary between (left) St. John and (right) St. Peter. The coats of arms below the relief showed the heraldic symbols of the King of France (centre), in addition to those of the Order (left) and of the Grand Master (right). 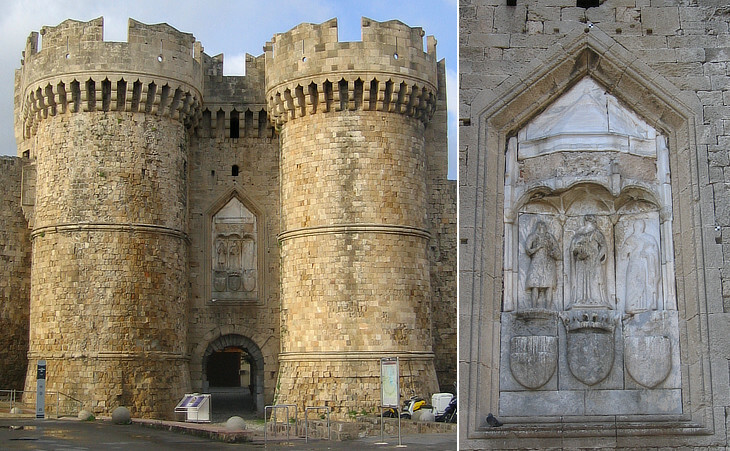 The most impressive gate of Rhodes from a military viewpoint is no doubt that built by Grand Master Emery d'Amboise: it was completed in 1512: the access was protected by two massive round towers clearly designed to withstand the Ottoman cannon. If the enemy had managed to make his way through the gate still he would not have gained access to the town; this because d'Amboise modified the design of the walls so that there were three other gates between the external gate and the town. For this reason the Ottomans called the overall system of gates Egri Kapi (Twisted Gate) (see Egri Kapi in Constantinople). The gate was closed in 1501 by Grand Master d'Aubusson and this explains why it does not show the same level of fortifications as those of D'Amboise's Gate: St Mary's Tower, the round tower which controlled the access to the gate, was built in 1441 by Grand Master Jean de Lastic. On Christmas' Day 1522, after the capitulation of the town on December 20, Sultan Suleyman made his entrance through this gate, which was opened for the occasion. He then closed the gate again and it has remained shut until 1922 when it was reopened for the 400th anniversary of the event and has remained open ever since. The Outer St John's Gate was built by Grand Master d'Aubusson to protect the previous fortifications built by Grand Masters Fluvian, Milly and Zacosta. In 1912 Italian troops made their entrance into Rhodes through this gate: the rectangular empty frame to the left of the gate housed an inscription celebrating the event. The gate is surrounded by a low wall and is protected by a high tower where Grand Master d'Aubusson placed a relief portraying St Paul: The Knights had their arsenal between this gate and that of St Catherine's: it had a direct access to the harbour; today Arsenal Gate is a modern opening in the walls which allows cars to reach the modern town. According to some sources Mills Gate was actually called St Catherine's Gate: the gate was the access to the Emporium from the Jewish quarter: it was not strongly fortified because the harbour was protected by other fortifications. St. Anthony's Gate was the old western gate of Rhodes: with the redesign of the walls it became the last gate of d'Amboise's Gate. The image used as background for this page shows St. Catherine's Gate seen from the town.